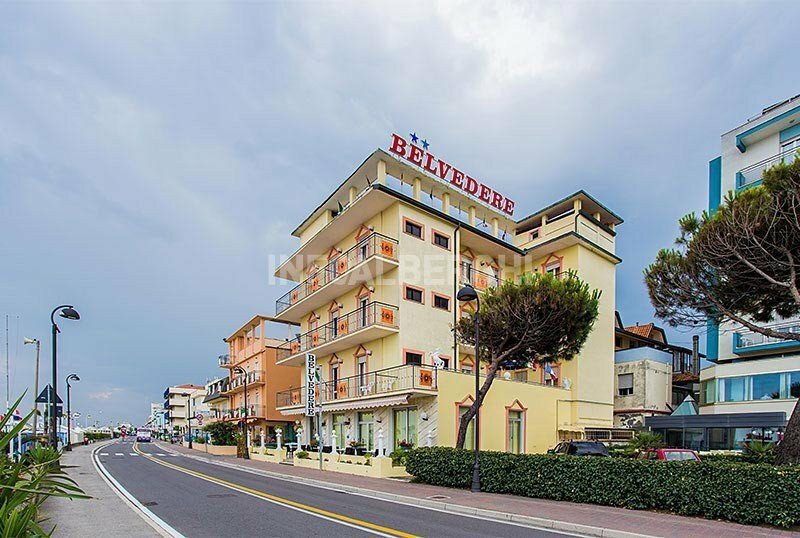 Hotel Belvedere is a 2-star hotel located in Igea Marina in a panoramic position just in front of the beach. Recently renovated, it has received the "recognition of excellence" from Tripadvisor in 2017 and 2018, has rooms with sea view, free parking and services for families. Accepts small pets. The hotel is located in Igea Marina, on the seafront in a panoramic position facing the beach. Elegant, with sea views and equipped with balcony, telephone, safe, ceiling fan, TV and private bathroom with shower (shower cubicle in 22 rooms). Hairdryer on request. Recently renovated, it has a garden, open-air porch, snack bar, reception open 24 hours a day, a reading room and organizes theme nights. PARKING: uncovered and reserved with 18 parking spaces. CONVENTIONS: beach, amusement parks, restaurant. BREAKFAST: buffet with cakes and ring-shaped cake of own production and savory products. LUNCH AND DINNER: 2-choice menu with buffet of side dishes and salads. Pasta and desserts are homemade. VARIATIONS: on request variations for children and for those with special dietary needs. In hotel: pediatrician on request and for a fee. At meals: high chairs, baby food, baby menu, bottle warmer. The hotel has an agreement with the plant n. 58, equipped with playground area, baby / mini / junior club, live entertainment. Take advantage of the first sun at the Hotel Belvedere in Igea Marina, we are waiting for you! Promotion valid from 1 May to 1 June for a minimum of two people. Contact us and come and discover the package designed just for you! Children 0-2 years FREE and others discounted! Your ideal holiday is only at the Hotel Belvedere in Igea Marina, right by the sea! The appointment with the Frecce Tricolori National Aerobatic Team on the Bellaria Igea Marina beach is back. The Belvedere Hotel is directly on the sea, 2 steps away from this fantastic show! Your relaxing holiday in August - September in the treatment you prefer!